With its wonderful characters and universal appeal, Sesame Street provides plenty of costume inspiration for kids and adults alike. Whether you plan to make or buy your costume, you'll love dressing up as your favorite character from this hit children's television show. With his towering height and bright yellow feathers, Big Bird is one of the most recognizable characters on Sesame Street. This is an ideal costume for adults, but kids will also love dressing up as the lovable avian. CostumeCraze - With its adorable frilly yellow dress and Big Bird headband, this baby-sized costume is sure to delight your little one. 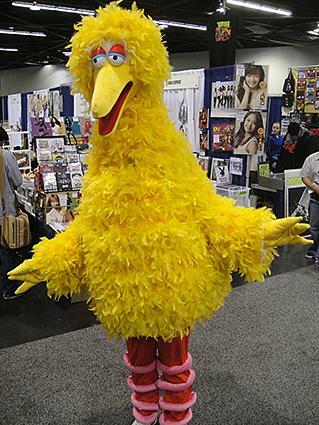 SpiritHalloween - This adult-sized Big Bird costumes includes a yellow plush pullover top and a plush Big Bird head. Using a hot glue gun, apply the yellow feather boas to the t-shirt in rows until the entire shirt is covered in feathers. Set it aside to cool. Purchase a yellow headband, and use the hot glue gun to attach yellow feathers to make your headpiece. Next, purchase two white craft foam balls. Use the glue gun to attach the balls on either side of the headband. These will be Big Bird's eyes. Hot glue two large googly eyes to the craft foam balls. Pair you headband and tunic with some orange leggings. This lovable red monster is one of the most popular characters on Sesame Street, and you can channel some of that popularity at your next costume party or Halloween event. Dressing up as Elmo is easy, whether you choose to purchase a pre-made costume or make your own. Costume SuperCenter - This grown-up-sized Elmo costume is sure to delight with its simple red puffy top and plush Elmo head. Amazon.com - This adorable kids' Elmo costume is perfect for infants and toddlers. With its comfy plush hooded jumpsuit, this costume is sure to please. Purchase a red t-shirt, red leggings or pants, a red stocking cap, several red feather boas, three foam craft balls, some black craft felt, and some paint. You'll also need a hot glue gun and glue sticks. Glue the feather boas onto the shirt and leggings in rows to create Elmo's characteristic fuzzy appearance. Use the hot glue gun to attach more feathers to the stocking cap. This will become Elmo's head. Paint one of the foam craft balls yellow, and leave the other two white. Glue both white craft balls close together in the front of the hat. Glue the yellow craft ball between them for Elmo's nose. Cut small circles out of the black felt and attach them to the white balls for Elmo's eyes. Love cookies? Then Cookie Monster might be the perfect costume for you. You can make or buy an outfit to transform yourself into this iconic Sesame Street Character. HalloweenCostumes.com - Made of soft blue plush fabric, this toddler-sized costume features a jump suit and Cookie Monster head. Amazon.com - This cozy toddler and infant costume features a comfy jumpsuit with an attached Grover hood. Purchase a blue t-shirt, blue pants or leggings, blue feather boas, a blue stocking cap, two white foam craft balls, and some place craft felt. You'll also need a glue gun and glue sticks. Hot glue the feather boa onto the t-shirt in stripes, giving your costume the furry look of Cookie Monster. Also, hot glue some of the feathers onto the stocking cap. Then glue the two white foam craft balls onto the hat near the top. Cut out a large smiling mouth from the black felt. Also, cut out two small circles for the eyes. Glue the two circles onto the craft balls to complete the eyes. Glue the mouth onto the front of the hat. Don't forget to carry lots of chocolate chip cookies to complete your look. The grumpy half of the Bert and Ernie team is a fun choice for Halloween or for a costume party, especially if someone else is going as Ernie. You can either buy or make a Bert costume. HalloweenCostumes.com - This site has a great Bert costume for adults, complete with a plush head, striped shirt, and bright green pants. Paint the clown nose orange and set it aside to dry. Cut the black yarn into pieces that are about eight inches long. You'll need about twenty pieces. Gather them into a bundle and fold it in half. Wrap more black yarn around the pieces to secure them, and then use a yarn needle to sew the bundle onto the top of the yellow stocking cap. This will be Bert's hair. Paint your face yellow and create a unibrow with black paint. Put on the hat, shirt, and nose. Add a grumpy expression, and your outfit will be complete. The friendlier half of the Bert and Ernie duo also makes a great costume. 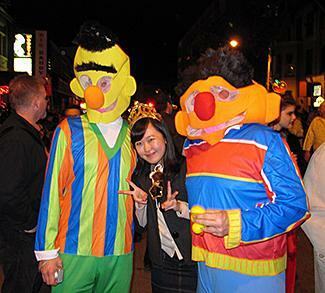 Whether you're pairing up with someone else dressed as Bert or going it alone, you can make or buy your costume. SpiritHalloween - Featuring everything from the Ernie mask to the pants and striped shirt, this costume is perfect for adults hoping to dress up as Ernie. CostumeCraze.com - This teen version of the adult Ernie costume is perfect for older boys. It includes a fabric Ernie head and striped shirt. Use the craft paint to make the clown nose orange. Set it aside to dry. Using a yarn needle, sew the black yarn onto the orange stocking cap, leaving loops of "hair." Continue doing this until you have quite a bit of hair, mostly on top of the hat. Paint your face orange, including your ears. Put on the striped shirt, orange nose, and Ernie hat. Add a yellow rubber duck and enjoy! Grover is another popular Sesame Street character, and he makes a fun and easy costume choice. You can buy or make a costume for this beloved character. Sears - This Super Grover costume is designed for teen boys and features a plush blue top, Grover head, and helmet. Amazon.com - This adorable toddler-sized Grover costume features a comfy jumpsuit and plush Grover hat. Use the craft paint to decorate the sweatshirt with a lightning bolt and the letter "G." Set it aside to dry. Paint the craft ball pink and set it aside to dry. Cut out two white circles and two smaller black circles from the craft felt. Hot glue the smaller black circles on top of the white circles. Then glue the eyes to the blue hat. Glue the pink craft ball onto the hat to make the nose. If you love numbers and can pull off a vampire accent, the Count might be the perfect costume for you. You can make or buy your costume or modify an existing vampire outfit. Amazon - Featuring a fabric Count head and a top with a detachable cape, this costume is the perfect choice for adults dressing up as the number-obsessed vampire. Kohl's - This Count costume has a fabric head, a T-shirt with printed Count jacket, and a separate cape. Using one yard of black felt, pin the shoulders to create a cape shape. Sew the area where you pinned, and then attach ties to hold the cape in place. Use purple face paint to create the Count's distinctive look. Pair it with a black jacket and pants. There's nothing quite as charming as the grumpy Oscar the Grouch. You can create this adorable character using a purchased costume, or you can easily make your own. HalloweenCostumes.com - This adult-sized Oscar the Grouch costume includes a green plush head and plush body with trash can. Cut out the bottom of a plastic trash can. Drill holes in the front and back of the can. Spray paint the trash can silver, adding details by hand. Attach straps to the holes you drilled. Dress in a green t-shirt that you've smudged with dirt or paint. Use colored hairspray to spray your hair green. Whether you purchase a Sesame Street costume or make your own, you'll have a look that will charm adults and kids alike. Dressing up as these beloved characters is a great way to show your love for your favorite TV show.